I’ve been a Brian Evenson fan for almost eight years now and I’m happy to say this fact has improved my life. It can improve your life as well with the small investment that is A Collapse of Horses, Evenson’s latest story collection. On the surface it’s much the same as his other short story collections. People variously label this work as horror, or literary fiction, or literary horror (and the publishers include a quirky page after the final story that says “LITERATURE is not the same thing as PUBLISHING”, which comes off as odd in a collection such as this). To be sure, there is horror here—the literary effect. But there is also something else going on that perhaps people are mistaking for horror, and that’s cognitive dissonance. That’s one of Evenson’s true strengths and it shines in stories like “Click,” my personal favorite in the collection, a tale of a recovering (or dying) man who cannot keep his environment straight. He has either been accused of a horrible crime or he has not. He’s either being visited by police and his lawyer or he’s not. What makes Evenson among the greats of this technique is that the success of the story does not rely on the resolution of the “is he or isn’t he” question, but in the ability to make the story work without conscious resolution. And this, my friends, is why I’ve been consistently recommending Evenson’s works to fans of Bizarro fiction. His writing is weird. Not capital W weird, at least not always. He’s doing weird things above and beyond literary horror. He’s doing things that are sometimes weirder than self-described Bizarros. As a whole, A Collapse of Horses is definitely a good introduction to Evenson’s short fiction. It contains a number of very accessible stories. “BearHeart™” begins as a cute, quirky relationship story and gradually devolves into psychosis. “Torpor,” another relationship story, revolves around the physical pains of a woman whose significant other loses an arm. “Cult” examines the mind of man who is contemplating joining a cult to escape an unhealthy relationship. In fact, there really are more relationship stories in this collection than horror stories. Sure, some of them involve horrific elements, but they really focus on loss, sadness, and alienation. There’s no real name for this genre, so let’s call it Sadcore and black our eyes. If I’m not mistaken, this collection includes the first Evenson short that is stated to be set on an alien world—“The Dust,” a story of a failed mining expedition awaiting rescue when the crew begins to be murdered brutally, one by one. This one is a horror story, though the space setting probably has people calling it science-fiction because people always love to recategorize things into whatever niche they enjoy. I just call it awesome because I speak plainly. There’s madness in many of these stories and Evenson has a great grasp of how to play with it. “A Collapse of Horses,” the title track, examines both dementia and obsession in a manner that is loosely reminiscent of his earlier stories “The Polygamy of Language” and “The Wavering Knife” but far more personal. After a head trauma, a man is convinced that some days he has three children, other days four, and this number can only be established by counting beds. The uncertainty, the disconnection from reality, of a man who has three children one day and four the next, is a complicated kind of terror that most writers have a hard time getting to the heart of, but this is a feeling he has been able to produce in me many, many times throughout his oeuvre. The titular story is great example of his masterful craft, but it is not even as powerful as some of his prior excursions into this territory. “Black Bark” is a story I recognized. It took a shape very similar to that of “The Second Boy,” which appeared in Evenson’s previous collection, Windeye. This is a story of two men escaping into the wilderness, one injured, who have to make camp in a less than ideal locale. The injured man tells an esoteric story that troubles the other man. Upon awaking the next morning, the injured man is nowhere to be found. The other searches for the man and for salvation, but unable to find either, retires to the same campsite where the other man shows up unexpectedly and menacingly repeats the story he told earlier while the other man is powerless to do anything about it. This is a description that could be applied to either of the stories I just mentioned. The similarities struck me and I wondered if this could be accidental. It seemed impossible. And while the stories have many similarities, they are both excellent and worth a read, so there was no complaint that “Evenson is repeating himself” in my mind. It’s like when Chuck Berry or The Ramones re-wrote one of their own hits. Still an enjoyable treat. But when I reached the end of the collection, I started to see yet another story that followed this very similar pattern. And in “The Blood Drip” the campfire story told is loosely “Black Bark.” That’s some pleasingly meta stuff right there. It works so well it made me smile despite the bleak nature of the story. So there’s a really sophisticated commentary going on here, and an exploration of how to achieve similar literary effects with different stories. Evenson is creating his own tropes to play with and it couldn’t be more awesome (that’s the clickbait title for this review, by the way). He’s reinvented the ghost story (that’s the tagline). Definitely a solid four star collection with enough 5 star stories to cause me to recommend it to everyone I know. Are you someone I know? Then you should read this, pronto. Then pick up The Wavering Knife and/or Last Days. Your life will become measurably better. This entry was posted on March 7, 2016 by G. Arthur Brown. 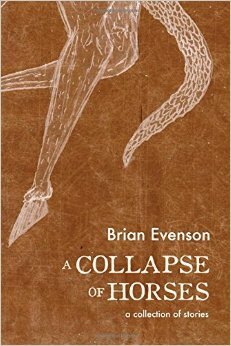 It was filed under Book Reviews and was tagged with a collapse of horses, book, Brian Evenson, reviews.